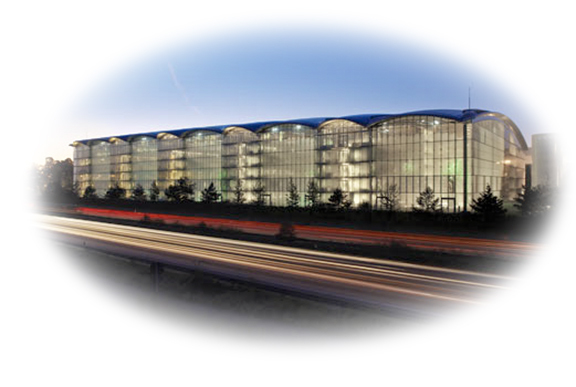 As part of our applied design and research for the designed environment project I have chosen Lufthansa aviation centre as contemporary case study for detailed analysis. Following on from my previous post on spun concrete the Lufthansa aviation centre in Frankfurt provides a recent example of spun concrete columns with impressive load bearing capacity. 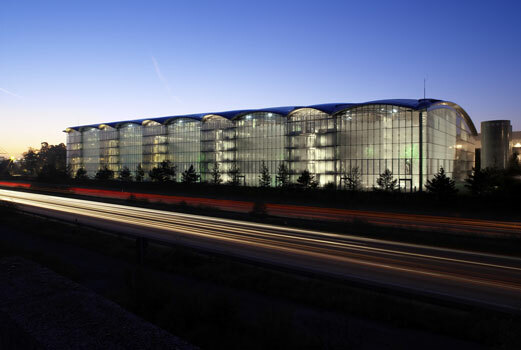 The building was designed by Christoph Ingenhoven and is located in the prime location where the intersection of the ICE high speed rail link and two highways meet Frankfurt airport. This beneficial location presented many challenges for the design because of the high noise levels. The offices were designed around a internal street scape with enclosed gardens to regulate environmental factors and to create a clean space free from road and rail omissions. What drew me to this case study was its use of spun concrete and 280mm long span concrete roof structure. In the last 20 years architects and engineers have moved away from long span concrete roofs and have replaced them with either steel or composite structures. My project is going to emphasise whether there will be a shift back to long span concrete roofs with the introduction of new technologies such as fibre reinforced concrete and spun concrete columns. When the project is completed I will upload the findings in the conclusion. Open any image that you want to work on. Now go to SELECT and choose Inverse. Click onInverse and watch what happens on the screen - your selection is reversed or inverted. Now go to EDIT and click clear. Hey presto, job done! Save your changes and rename for future use.